December closed the year with a “double whammy” of negative volume growth and negative yield growth, resulting in a year-on-year (YoY) airline revenue drop of 5.6 per cent in USD (1.9 per cent in EUR), according to cargo market data company, WorldACD. “Viewed against the market developments we witness since September, December closed the year ‘in style’, that is to say by recording negative YoY growth. The month can be justly characterised as weak,” says WorldACD in its most recent update. The last week of 2018 was particularly worrisome with volume a serious 10 per cent below the same week in 2017. Overall, December volumes from the larger regions (Asia Pacific, Europe and North America) dropped by larger percentages than those from the smaller areas. 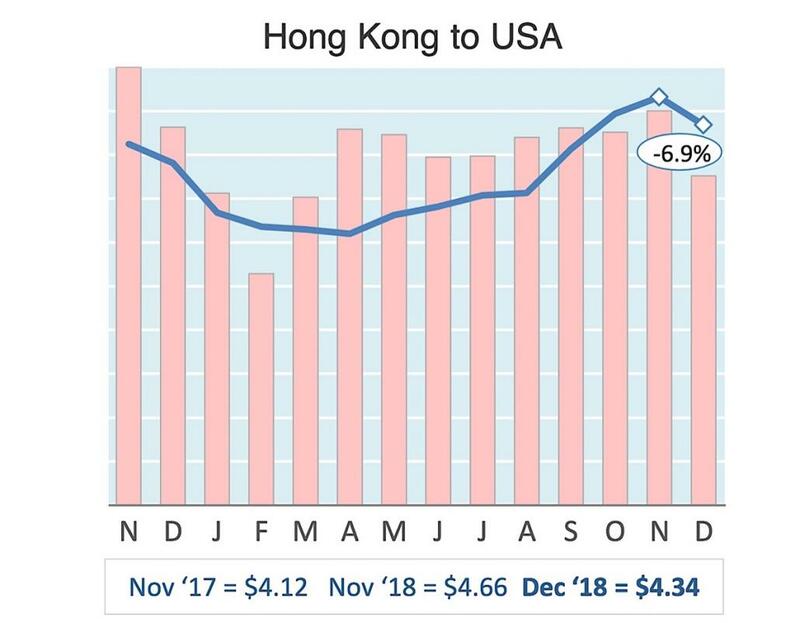 For the market most clearly in the limelight these days, ACD notes that – in terms fo YoY volumes in December – China & HKG did better to the US, which was down 3.6 per cent YoY, than to the world as a whole (-4.8 per percent YoY). In the opposite direction, the picture was quite different: US to world (-3.4 per cent YoY), did significantly better than US to China/HKG (-8.0 per cent YoY). WorldACD observes that air cargo showed two distinct faces in the year 2018 as a whole. 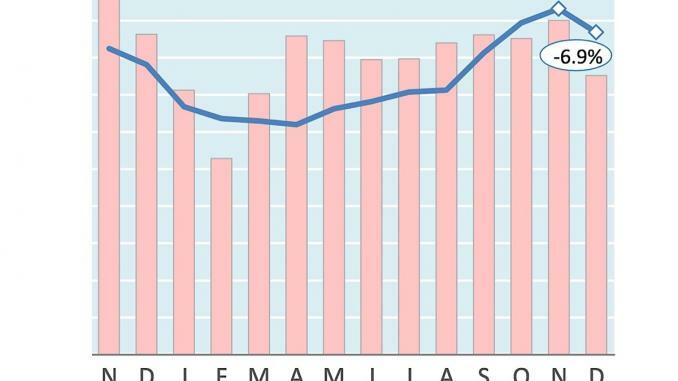 Each month in the period Jan-Aug showed YoY volume growth, albeit in ever smaller percentages as the year progressed. Still, the 3.7 per cent YoY overall growth in that period looked good, given the fact that 2017 had been a bumper year, WorldACD sasys. In the period Sep-Dec, however, things started to look much less positive. Three out of the four months showed a YoY volume decrease, resulting in an overall decrease for this period of 0.6 per cent. Volume for the whole year was 2.2 per cent up on 2017. The YoY yield rise (in USD) was 15 per cent in the period Jan-Aug against 4.2 per cent for Sep-Dec, a development that seemed to be in line with fluctuations in the oil markets: jet fuel became rapidly more expensive in the months leading up to September, whilst going down in the later part of the year. Another significant development in 2018 was the recovery of the origin Central & South America (C&SA), which increased its outgoing volumes by 8.4 per cent YoY. In terms of airline revenues (in USD), the region also stood out with a 16 per cent growth YoY. At the other end of the range is origin Africa, which generated airline revenue growth of only 4.2 per cent. Worldwide, airlines added 13.2 per cent to their revenues in USD (8.7 per cent when measured in Euro’s). Five smaller origin countries looked like “havens of stability”, each managing to record a YoY volume growth 12 months in a row: Chile, Costa Rica, Cambodia, Uganda and Mozambique. 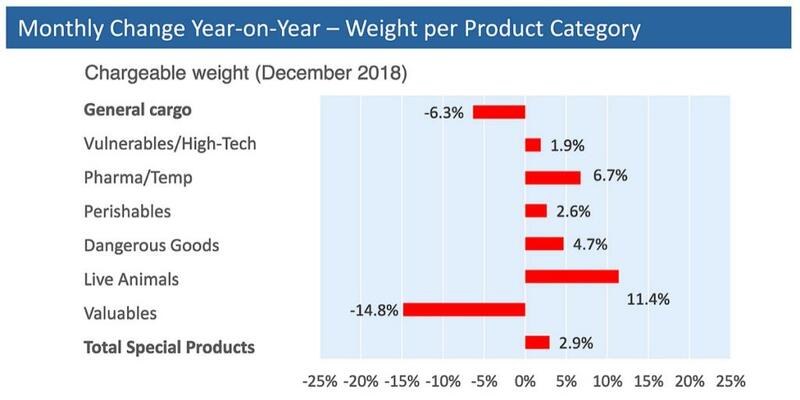 Among the various air cargo categories, pharmaceuticals kept its leading position in YoY volume growth (+14.8 per cent), followed by Dangerous Goods and Vulnerables/High Tech (+7.7 per cent each). Fruits & vegetables were the only category with negative YoY growth (-0.2 per cent). All in all, specials increased by 5.4 per cent, as general cargo increased by 0.9 per cent only. WorldACD notes that only last week, the Economist wrote about a phenomenon it called ‘slowbalisation’, making the case for deeper links within regional blocks with supply chains sourcing closer to home in North America, Europe and Asia. “Do we notice the same in air cargo? Yes and no,” says the cargo analytics company. Against an average air cargo growth of 5.7 per cent worldwide in the years 2016 to 2018, the region Asia Pacific showed 6.2 per cent growth for intra-regional volumes. However, the overall importance of intra-regional air cargo flows as a percentage of the worldwide total, steadily declined between 2014 and 2018 from 20.4 per cent to 19.1 per cent. Looking at ‘near-sourcing’ from another angle: The YoY increase in volume in 2018 (2.2 per cent) was smaller than the increase in Direct Tonne Kilometers (3.0 per cent), meaning that the average distance between origin and final destination of shipments slightly increased. 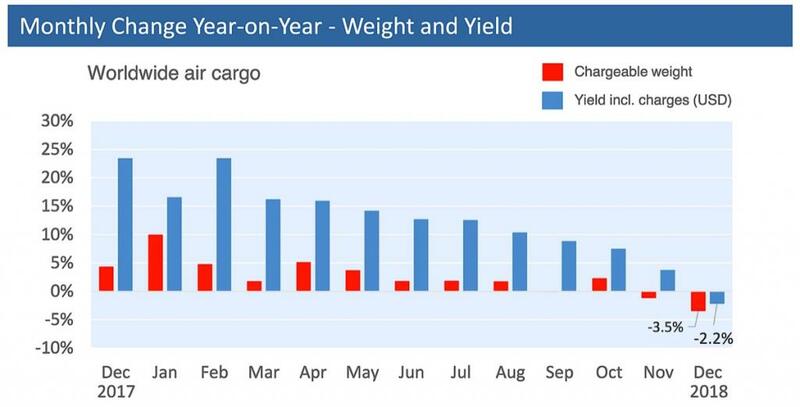 December closed the year with a "double whammy" of negative volume growth and negative yield growth, resulting in a year-on-year (YoY) airline revenue drop of 5.6 per cent in USD (1.9 per cent in EUR), according to cargo market data company, WorldACD.